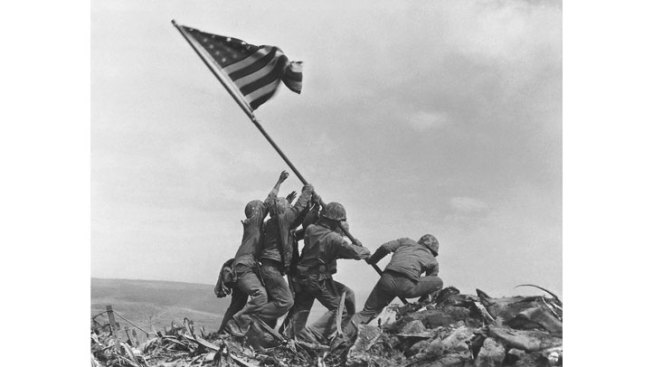 This Feb. 23, 1945 file photo shows U.S. Marines of the 28th Regiment, 5th Division, raising the American flag atop Mt. Suribachi in Iwo Jima, Japan. The National Museum of the Marine Corps will honor a photographer who took the iconic image of World War II servicemen raising a U.S. flag over the Pacific island of Iwo Jima. A bronze plaque honoring Joe Rosenthal will be dedicated on Oct. 9 in Triangle. Rosenthal took the Pulitzer Prize-winning photograph on Feb. 23, 1945, while working for The Associated Press. He later worked for the San Francisco Chronicle for 35 years before retiring. Rosenthal died in 2006 at age 94.